By Dan Ambrose: Marcos Maidana (31-2, 28 KO’s) moves up in weight to face former IBF/WBA light welterweight champion Devon Alexander (22-1, 13 KO’s) in a fight in the welterweight division on February 25th in Alexander’s home city at the Scottrade Center in Saint Louis, Missouri. Alexander must be like the spider to the fly, Maidana, as Alexander does incredibly well when he’s fighting at home in Saint Louis. Indeed, Alexander has never been beaten there before and he’s won recent fights over there against Andriy Kotelnik and Lucas Matthysse that he appeared to lose but was given what boxing fans saw as a hometown decision. His last opponent, the Argentinian Mathysse, had plenty of forewarning not to agree to fight Alexander, #1 WBC, #3 WBO, #8 WBA, in Saint Louis but he took the fight anyway, thinking he would either knock Alexander out or win co convincingly that there would be no way that he wouldn’t be given the decision. But sure enough, Matthysse lost the fight despite appearing to be the better man. Now it’s Maidana’s turn. He didn’t have to take the fight over there but obviously was lured in by the bigger money he can make by fighting there, as often Alexander attracts huge full capacity crowds at his fights. Maidana may have an even tougher time than fellow countryman Matthysse in trying to beat Alexander by decision because he doesn’t have the same boxing skills as Matthysse nor does he have his hand speed. Alexander is an excellent boxer and is a lot faster than Maidana. It’s probably going to come down to whether Maidana can connect with something big enough to hurt Alexander and make him quit for him to win. You can kind of see why Maidana took this fight, as Alexander seemed to fall apart under the inside pressure from Timothy Bradley in a 10h round technical decision loss to Bradley earlier this year in January. However, Bradley had a lot more hand speed going for him compared to Maidana and he was excellent on the inside against Alexander. Maidana is a decent inside fighter, but he’s not on the same level as Bradley, and he has a bad habit of gassing out late in his fights. For Maidana to beat Alexander, he’s going to have to stay on top of him and pressure him constantly for the entire fight in order to have a chance of winning it. 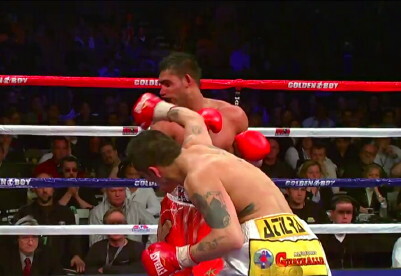 Maidana can’t gas out in the 10th and hope to get a decision. If he gives away the championship rounds to Alexander then he can forget all about winning. He’s got to win the last three rounds and hope to do enough in the earlier part to scrape out a decision. I can’t see Maidana making Alexander quit the same way Bradley did.